The summer months are just ahead, and for many of us this means days full of cycling and plenty of camping excursions. 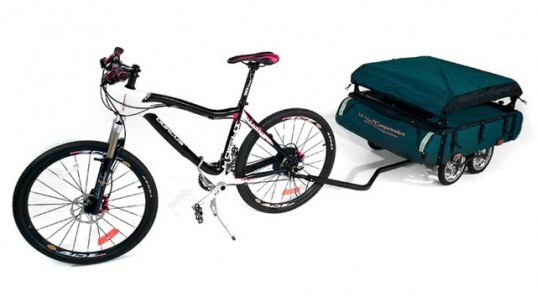 But for you outdoor adventurers who don’t want to trade in your two-wheelers for four, now you can combine the two activities with your very own bike-trailer! 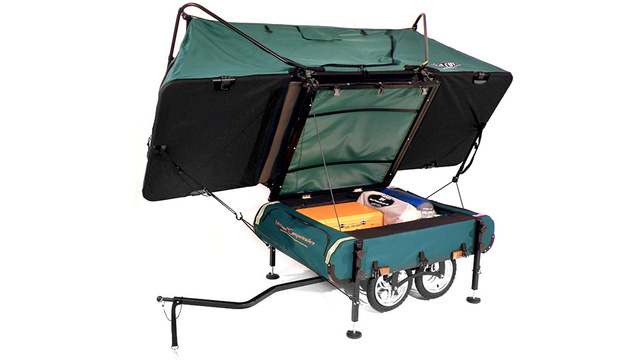 Dubbed the Midget Bushtrekka, and made by Kamp-Rite, this cool design goes from an ultra-compact carrier to a cool tent complete with cot-bed and some cozy amenities. The Midget Bushtrekka‘s four wheels operate independently from one another and they can take on serious bumps in the terrain — although perhaps some steep mountain paths are out of the question with this one. It also comes equipped with levelling jacks so no matter where you’re parked, you can sleep flat. And with 41 gallons of storage space, panniers are a thing of the past — but be warned that even empty the Midget Bushtrekka weighs 56 pounds. It comes with levelling jacks so no matter where you're parked you can sleep flat. And with 41 gallons of storage space, panniers are a thing of the past. But be warned that even empty the Midget Bushtrekka weighs 56 pounds. The trailer's four wheels operate independently so it can take on some bumps in the terrain, although perhaps some steep mountain paths are out of the picture with this one. Long summer months are ahead and for many of us that means cycling and camping holidays await. Now you can combine the two with your very own camper bike-trailer, bringing some of the comforts from home to the wilderness with your own mini pop-up camper, the Midget Bushtrekka from Kamp-Rite.